I made this in the grinder, you can make this in mortar pestle as well. As we have added peanuts and sesame seeds, the shelf life is less. 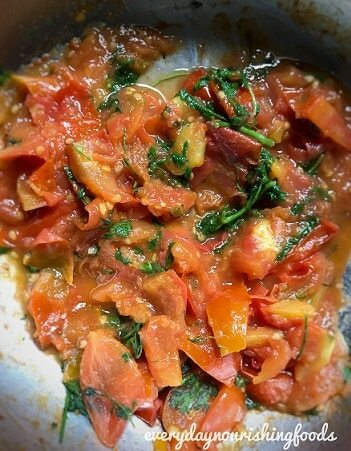 This recipe doesn’t have garlic, you can add few garlic pods as well while cooking tomatoes. You can find another chutney recipe with Malabar spinach here. Traditional Andhra recipe made with tomatoes, peanuts, sesame seeds and other spices. 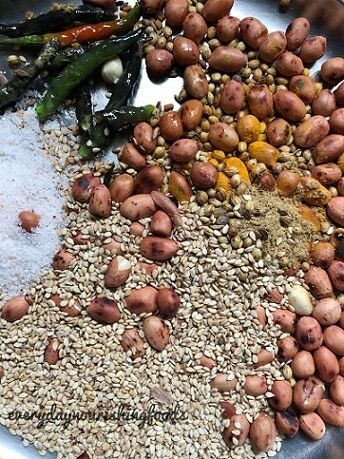 Heat kadai and dry roast peanuts, sesame seeds, coriander seeds, cumin seeds and methi or fenugreek seeds one by one. To the same kadai add oil and fry green chilies and keep them aside. Now add chopped tomato and cook till done. Add chopped coriander leaves and switch off the flame. Once the ingredients are cooled a bit, add these to the grinder and make a smooth paste out of it. You can add few raw garlic cloves as well while grinding this mixture. Once the ingredients are cooled a bit, add these to the grinder and make a smooth paste out of it. Copyright © 2019 Everyday Nourishing foods | Bard Theme by WP Royal.